Yi Zhao graduated from the University of Arizona's College of Social and Behavioral Sciences with a Bachelor's in Philosophy and two minors in Japanese and East Asian Studies in 2018. Zhao is headed to the University of Tokyo for a Master's degree on Global Society where he will be able to use his major in philosophy and minors to study globalization in an interdisciplinary program. The Philosophy department is offering a variety of courses over the summer of 2019. Many of the courses are offered in more than one summer term. Explore summer classes in UAccess. Dr. Justin Weinberg, University of South Carolina, summarizes pay data collected by PayScale showing that Philosophy majors tend to make more money than other humanities manjors. For more details please see the article in Daily Nous. Registration for Winter 2018 and Spring 2019 is underway. You can visit UAccess Student Center to find your registration time or visit the Registrar's Office website for the full schedule. 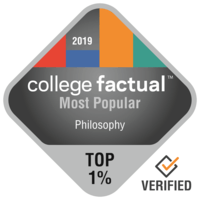 The University of Arizona Philosophy Department ranked in the top 1% for the Most Popular philosophy programs by College Factual. Philosophy also ranked in the top 10% in the 'Most Popular Online' and 'Top Ranked Veterans' categories for this school year.